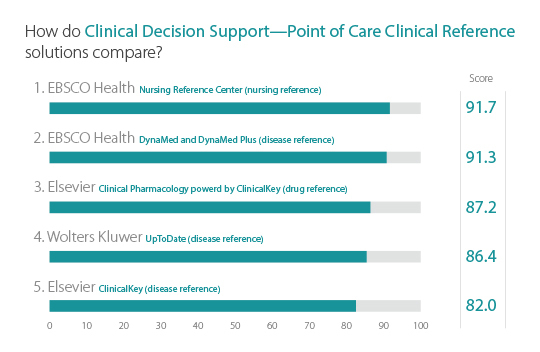 Nursing Reference Center Plus has been named 2018 KLAS Category Leader for Clinical Decision Support – Point of Care Clinical Reference in the 2018 Best in KLAS: Software & Services report. Nursing Reference Center Plus is committed to educating nurses about evidence-based medicine and nursing best practices. As a part of that effort, Nursing Reference Center Plus focuses on ensuring that staff nurses, nurse educators, recent nursing graduates, and nursing students have quick and easy access to the most current information to provide the best care possible to their patients. Nursing Reference Center Plus provides staff nurses and nurse educators with a resource that supports education goals, encourages nursing students to access the original research and provides options for patient care while preserving and supporting the essential learning opportunities that educators want to provide. Whether in a clinical setting or on the go, Nursing Reference Center Plus provides nurses with quick and easy access to the most current nursing information. 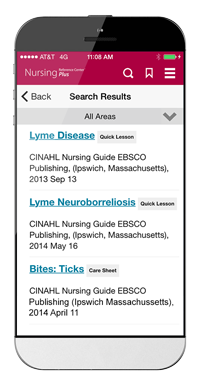 Complimentary with all subscriptions, the Nursing Reference Center Plus mobile app gives nurses instant access, both on and offline, to content on their iPhones, iPads or Android devices. With the help of CINAHL Courseware Cloud Solution, the invaluable continuing education (CE) content found in Nursing Reference Center Plus can be easily integrated into any SCORM 1.2-compliant learning management system (LMS). Nurses can conveniently search available CE topics directly from your LMS, selecting courses that meet their needs. Upon course completion, their results will be automatically reported back to your LMS for record keeping.